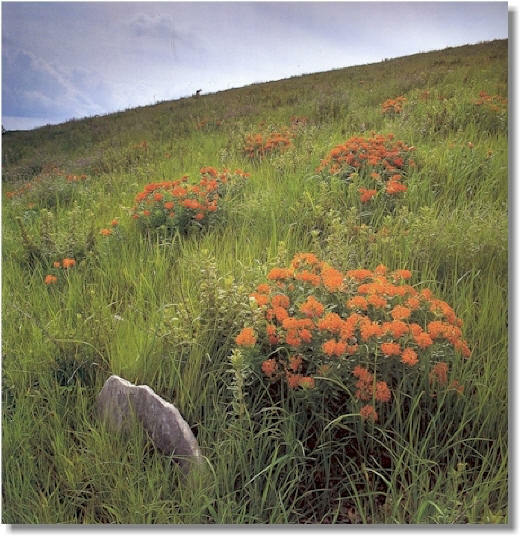 Butterfly milkweed delights the eye in this photo of a hillside in Chase County. Photograph © by Daniel Dancer, used by permission. "As to scenery (giving my own thought and feeling), while I know the standard claim is that Yosemite, Niagara Falls, the Upper Yellowstone, and the like afford the greatest natural shows, I am not so sure but the prairies and plains, while less stunning at first sight, last longer, fill the esthetic sense fuller, precede all the rest, and make North America's characteristic landscape."